Claude struggles with a design for his next commission. I really like this show. Despite the very little that apparently happens in each episode, it always seems to stimulate so many topics to talk about. Episode 3 of Ikoku Meiro no Croisée is no different. Rather than following all of the fascinating little back alleys this episode reveals, I’ll try to stick to one particular thread: in this episode we get to see some previously hidden parts of Claude’s work process, and, notably how he gets help from Yune. Before I continue to my main point, however, I thought I would note that i have seen the title of this show translated two different ways. The first, Crossroads in the Foreign Labyrinth, and the second, Crossings in the Foreign Labyrinth. “Crossroads”, at least in the Western tradition, are generally associated with choices, whereas “crossings” seems to imply encounters. Of course, crossroads are the point of convergence of two or more paths, so they are certainly a type of meeting as well. I believe (based upon the content of these first three episodes) that this notion of “meeting” is the intended meaning, not “choices”. The show is very much about how people (at least those who are open to it) can be changed by the people they meet. 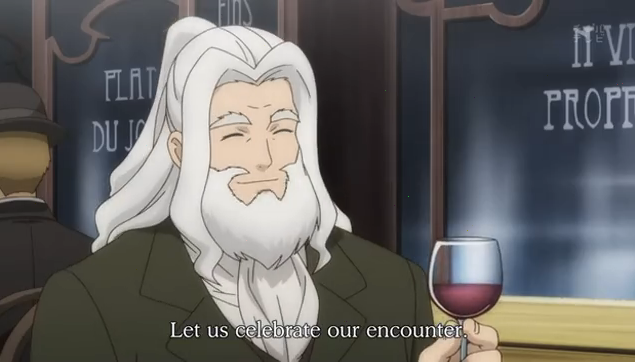 In this episode it is Claude who is changed by his “crossing” (encounter) with Yune. 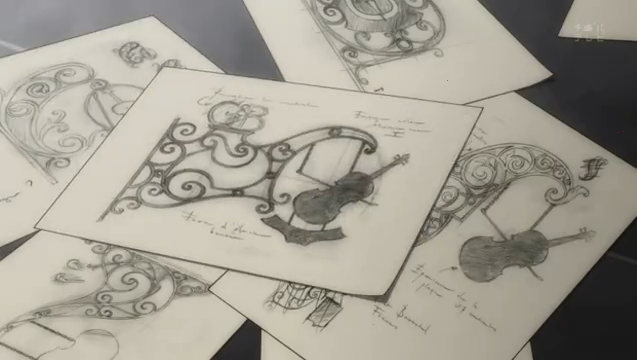 Claude's designs include a violin, but are a bit too literal. Claude has accepted an order for a sign for a music shop. Unlike previous sales, this time he is to complete the sign, and won’t be paid unless the customer approves. This is, of course, risky, and Oscar takes this as an indicator that the shop is not doing very well. 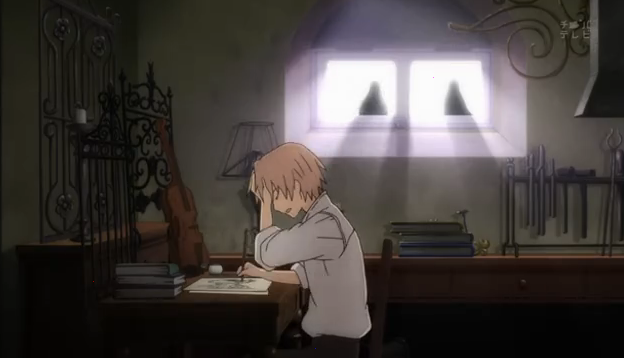 In the early part of the episode Claude is seen using a drum as well as a violin as a reference in coming up with design candidates, but all of his designs seem very literal, and he is clearly dissatisfied. It is also clear from Claude’s questions about Japan that he is hoping to find some inspiration from Yune’s presence. Claude takes inspiration from Japanese writing. Note the inkpot to the right. Eventually Claude has a conversation with Yune about Japanese writing. He has her write her name, and finds out that it means, “the sound of hot water”. 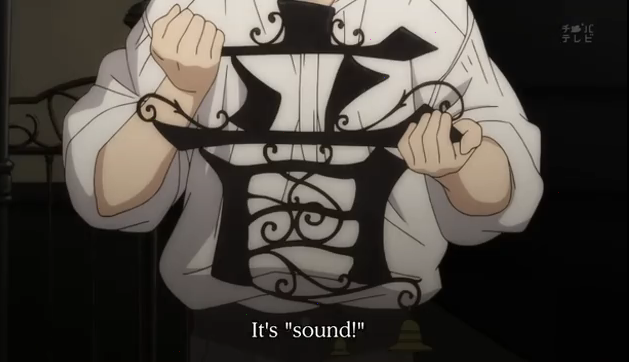 The “ne” part means “sound”, and Claude uses that as his inspiration for the new sign. 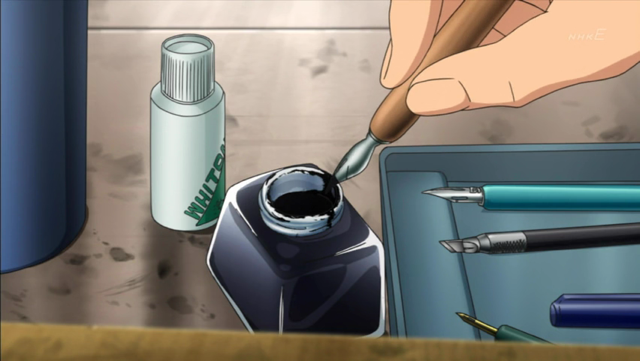 You can see in this screen shot an interesting detail, an ornate inkpot, which can be compared to the pen and ink systems shown in Bakuman. Claude works his metal while Yune watches the store front. When he finally comes out, he seems pleased with the result. He shows it off to Yune, who recognizes that he is learning something of her culture, and is being honored by having part of her name be the inspiration for the design. Outbound logistics: Claude carries the finished product to the awaiting customer. Claude runs off to meet with the customer, who buys the finished product. As he leaves the shop, however, we get another indicator of the trouble looming in the background. You can see in this screen capture that another shop in the Galerie du Roy has gone out of business. Fermé, I believe, means “stop”, but in this context it must mean that the business has been permanently closed for business. 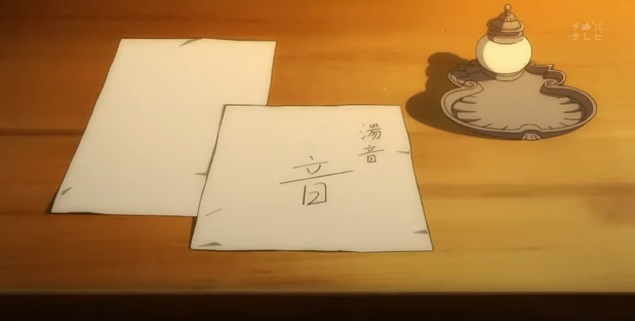 As thanks for her help, Claude goes to buy Yune some stationary, so she can write “a proper letter” to her sister, instead of writing on scraps. 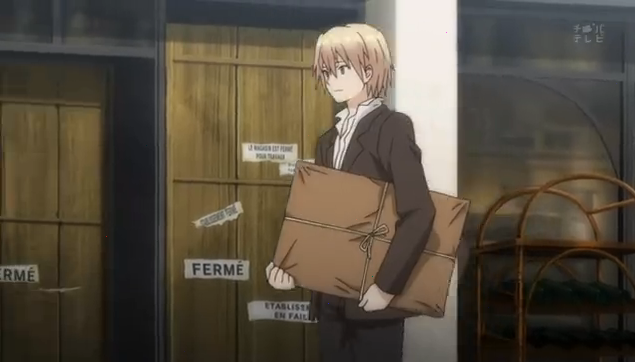 This is another opportunity for Claude to comment that there was once a stationary store in the Galerie, but it went out of business. I am intrigued that they are continuing to develop this theme of small craft-based shops, versus the power of large modern department stores (and those who own them). While Claude is changed by his encounter with Yune, as described above. Oscar uses the origami he learned from Yune as an improved way to hit on women. You’re right: this show has managed to bring up some good social and economic issues to think about (and even if it didn’t, Yune is adorable to watch). I just hope it won’t be all about the small, family run businesses versus the large department store owned by the wealthy, and how ‘evil’ the department stores are. So far, the blonde girl is coming off really, really bratty – which I dislike. I really hope she doesn’t stay like that for the entirety of the series. Well, give her a chance. She hasn’t met Yune yet. Maybe that will be her opportunity to learn to be a better person. So far the only person who really thinks the department stores are ‘evil’ is Claude, so that characterization really has a lot to do with his personal perspective. We’ll have to see what happens. That’s definitely what I have been getting out of it. I even just like seeing those scenes of people fishing and so forth. It is kind of like traveling, and seeing how other people live (except it is really about a different time). Yune is cute, though. I am intrigued by all the intricate details they draw on her outfit (it seems to be covered with knots, and designs, and so forth. It must make drawing even a simple scene with her in it a lot of work. Anyways, even if it is a fiction, it is nice to see people finding a way to get along. In my ideal of the way the world works, people learn something from each other, hard work pays off, and people can find happiness in the end. Even if it doesn’t happen in reality, I enjoy seeing it represented sometimes, else I will get in a bad mood. I loved what you said about crossroads being a point of convergence. Claude’s design is totally the converging between East and West, and it’s really nice to see that going on. Yune can be quite the muse! Yeah, Claude seems to be more open to understanding Japanese culture tan he seemed at first, or at least, through Yune, he has become appreciative of what Japan has to offer. I liked his comment about being afraid to break the tea set, too. He bends metal for a living, so Yune must come across as delicate herself.